Create an organized office with the IKEA PAX system! 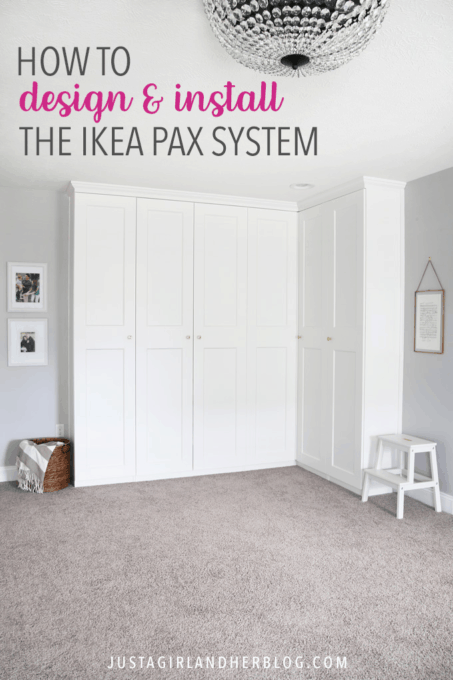 Learn how to design and install IKEA’s PAX system to maximize your storage space! A huge thanks to IKEA for sponsoring this post! 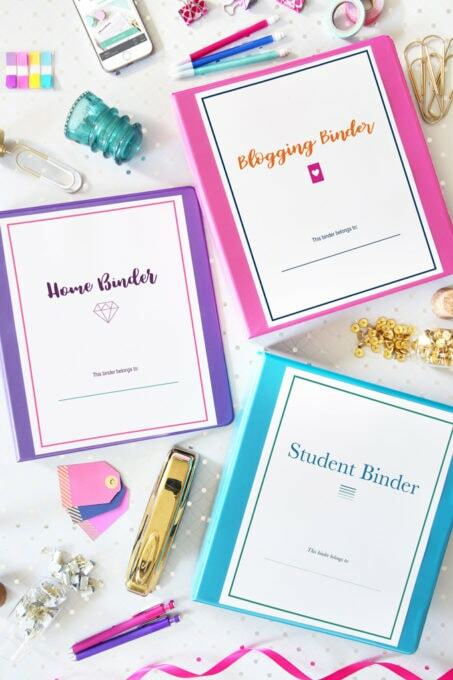 My favorable opinion of beautiful, high-quality products that help me stay organized is 100% my own. 🙂 For more information, see my disclosures here. 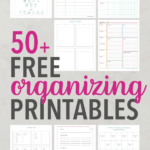 It’s no secret that I love organizing at any time of year, but I get especially excited about it in January! 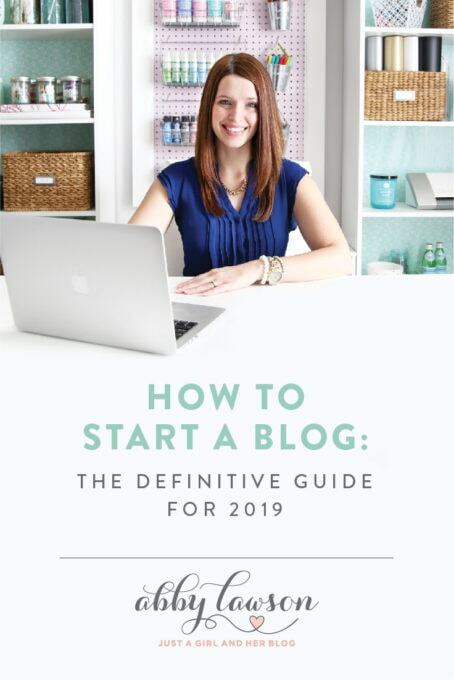 The New Year always feels like a blank slate where anything is possible, and I was determined that this year I wanted to tackle one of the big organization projects that I’ve been waiting to take on since we moved into our house over a year ago now…my office! 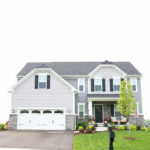 My office space was one of the biggest things that sold me on the model of home we chose to build. 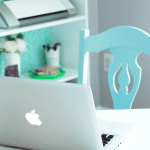 Since I work from home, a really functional office space is absolutely essential, and this one had a ton of potential. 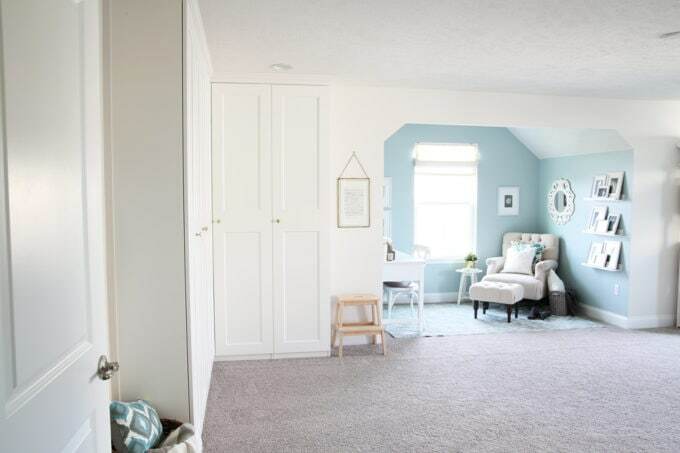 It is technically the “bonus room” over the garage, and it is huge– about 22′ x 14′! When we moved in, it was a big, empty space, and I was excited to start filling it up. Since I knew my office was going to be a big project, I decided to tackle it in phases. Right around Mother’s Day this past year, I completed phase one: my little nook! 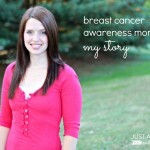 …but it still felt cluttered, and I knew I needed a more permanent solution. Enter, January! 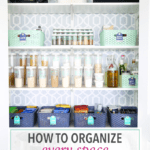 With the month of organization upon us, I decided that it was time for phase 2 of my office plan to get underway! I wanted to find a way to add functional, beautiful storage to this corner, so I started dreaming and scheming and looking into different options. One option I considered was bookshelves. I had open bookshelves in my previous office and I really liked them, but the more I thought about it, the more I realized I wanted more closed off storage in this room. My next thought was to bring in lower and upper kitchen cabinets. I knew this would give me tons of storage, but I began to worry that kitchen cabinets would look out of place in an office. As I took inventory of all of the items I was trying to store, I also realized that many of them were tall, vertical pieces that wouldn’t fit well in kitchen-like cabinets anyway. I kept researching and looking into different options, and I was thrilled to come upon the IKEA PAX system. PAX is technically a wardrobe system, but as I looked through the different sizes and options available, I knew it would be the perfect storage solution for my office corner. I pulled up the PAX planner on IKEA’s website and began playing around with different configurations. There are a ton of possibilities with the planner, but it is broken down in a way that made it simple to build my ideal storage combination. First I had to choose between two height options for my storage unit. My office has 8′ ceilings, so the taller 94″ high cabinets were perfect and really helped me maximize my storage space. I then needed to choose between the two options for the depth of the cabinets. One of my biggest concerns for this storage unit was that it would look like this big behemoth that we plopped down in the space; I wanted to make sure it flowed naturally with the rest of the room, so I was already leaning toward the narrower of the two depths. When Donnie and I got out painter’s tape and taped out some different options in the space, we realized that in order to use the deeper cabinet option, we would need to relocate the can light in the ceiling, which we didn’t really want to do, so that solidified our decision to go with the narrower 14″ depth cabinets. Once we had decided on our height and depth, we played around with a bunch of configurations within the PAX planner. Our unit included a corner, so we started there and built out. We ultimately ended up with (from left to right): a 20″ wide cabinet, a 40″ wide cabinet, the corner unit, and another 20″ wide cabinet. 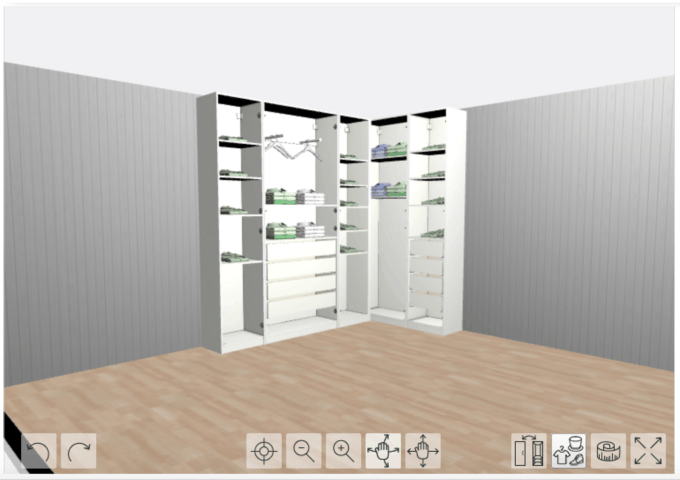 After I had chosen the cabinet frames, I thought about what I needed to store and configured the interior organizers to match up with my storage needs. I ended up with two sets of four drawers– one wide set and one narrower set– a clothes rail for some hanging items, and a bunch of shelves. Finally, I selected my door style– I went with the GRIMO doors. Donnie took our product list to the store, they pulled all of our items, and he loaded up the car and headed home. I was amazed that with as big as I knew our unit would be, they managed to fit all of the pieces in our small-ish SUV! The assembly process took some time because of the number of pieces we had, but it was straightforward and easy to follow. Donnie built out the frames and anchored them to the wall… at this point I got SO excited about all of the storage that I knew was coming!!! 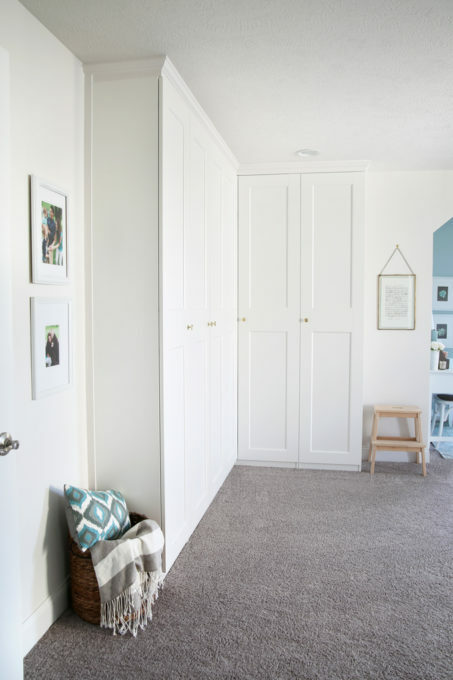 My fears about the unit not fitting in melted away– it was the perfect way to add a ton of storage while not overwhelming the room. 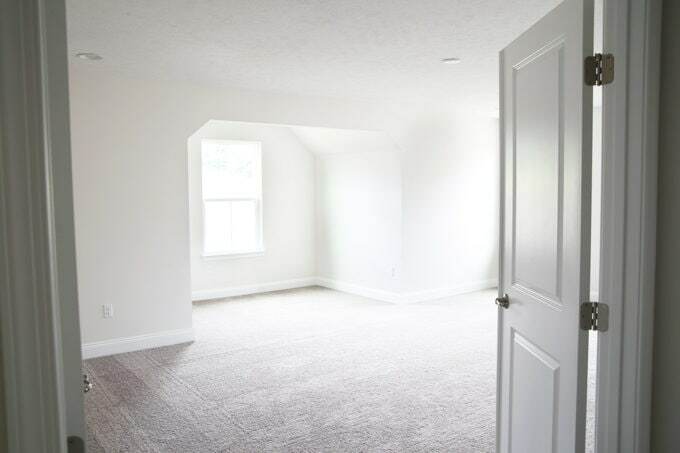 The shot below is taken from the doors as you enter the room, and you can see where the unit is compared with the nook. About half of the room is finished and ready to go! I can hardly believe it! Because this post is already massively long, I’m going to do a separate post where I talk about the nitty gritty details of how I organized the interiors of the cabinets, but I did want to give a quick peek inside each one so you can see how they are laid out. A few weeks ago I created a little wrapping station to get ready for Christmas, and all of those items were able to be relocated into the PAX unit– you can see the wrapping paper in the first cabinet. I also used the shelves to hold some of my decor items that aren’t currently in use in other spaces in our house. My Silhouette cutting machine and supplies fit neatly into the second cabinet, and I used the clothes rail in this cabinet to hang my wreaths and larger gift bags. 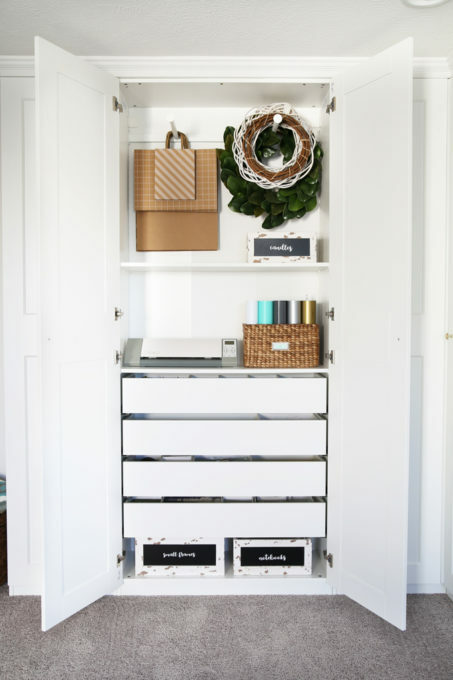 There are four long drawers that are able to hold a ton– just what I needed! Because of the door hinges, the drawers can’t attach at the very bottom of the unit, so I was able to slide a few crates I already owned underneath the drawers for extra storage. Here’s a little peek into one of the drawers. I used some white SKUBB boxes in various sizes to organize my smaller gift wrapping supplies! When I was planning our PAX configuration, the corner was the most challenging part for me to visualize, so the photo below shows how it is set up. The piece on the right slides behind the piece on the left slightly, but it is shallow enough that everything is still easily accessible. My FJALLA storage boxes were the perfect size to fit on the top shelves in this cabinet! I opted to keep a bunch of my faux greenery in the left part of the cabinet, and some of my photography equipment and extra picture frames on the right. Finally, the last cabinet holds more of my decorative items, my laminator, and the smaller drawers hold some office and craft supplies. Again, I was able to tuck two small storage boxes underneath the drawers to really maximize the storage space. 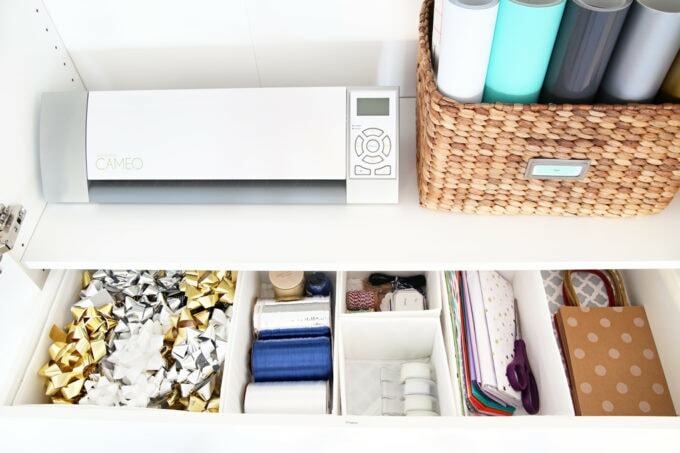 Have you ever used the PAX system to organize your home? I’d love to hear where and how you’ve used it in the comments below! It looks so pretty! I agree with keeping it narrow, it looks like it totally belongs in the space. Nicely done Abby (& installation Donnie)! Thank you so much, Brittany! I actually had a friend over the other day, and I pointed out the unit to her and she said, “Donnie put that in?! It looks like it was already part of the room!” and that’s when I knew I had achieved my goal, lol! Hope you are having a great week! I have never heard of that until today but WOW that was a long time comin’! This is totally something I could use. I’m gonna talk to the hubby tonight! Aw thank you so much, Ellen! I am really loving all of the storage! Hope you’re having a wonderful week! It looks amazing! Consider me inspired to step up my own home office game! Lol! Thank you, Kelly! Have fun with your office projects! I love this idea!! We have a spot in our basement finished room that’s a corner like this. I’ve been contemplating doing kitchen cabinets too and open shelves or a book case on the top and I just can’t seem to find anything that will really work. Or anything that’s narrow enough. Right now all of my decorating supplies are on an old bookshelf sitting there and also grouped on the floor. It’s driving me crazy because I need better storage. I may just have to copy this idea. There’s sooo much storage in those wardrobes!! Thanks for sharing. Your office is looking so beautiful! Thank you, Christene! It sounds like your basement spot would be perfect for something like this too! I couldn’t believe how much I was able to store in there even though we went with the narrower cabinets! Hope you’re having a wonderful week!! Wow! It looks great! What a relaxing spot to work in. Thank you so much, Christine! Hope you’re having a wonderful week! Abby, it looks so good! I love the PAX systems, they’re such a stylish storage solution. 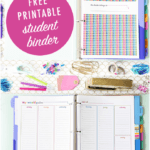 Love how yours turned out – and it’s so functional!! It looks amazing! I love your organization ideas. Thanks for sharing! Thank you so much, Jennifer! You are the sweetest! I’m just glad to finally have some storage in this space, lol! Hope you’re having a wonderful week! Oh my! I definitely have storage-envy here! Looks SO pretty, Abby! As I was reading the post, I kept thinking, “Someday, someday…” These would work GREAT in a small home that had little closet space. The narrow depth is GREAT! Again… someday, someday. 🙂 Thanks for sharing… it’s WONDERFUL! Thank you, sweet Julie! I feel like I have a list of “Someday, someday…” projects a mile long! (Much to Donnie’s chagrin, lol!) Hope you’re having a wonderful week! 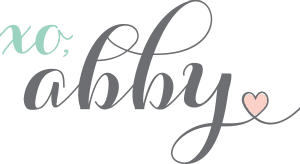 I am so excited for you, Abby! You have waited a long time for this dream to come true. Love the crown molding. It looks like it has always been there. Comgratulations, sweet friend! 💕IKEA! 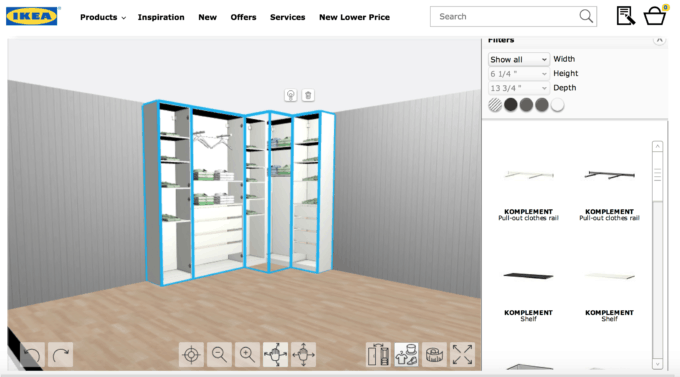 This is organisation heaven, I didn’t know you could plan your own Ikea fitouts and am definitely going to be investigating this. It looks amazing and I bet it feels so good to have that corner totally how you want it. 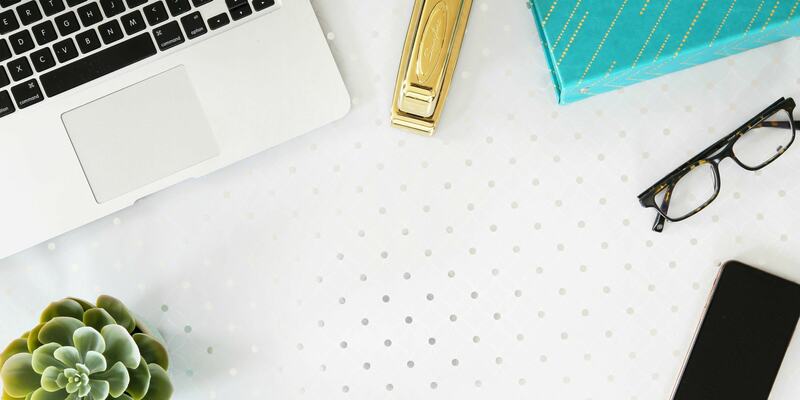 January is definitely the month for organisation, I feel the need to start sorting right away now – thanks or the motivation! 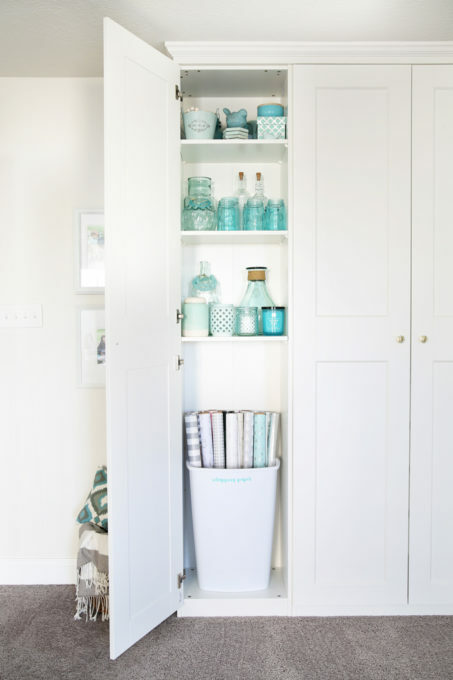 recycle containers but it never looks uniform and pretty.I want to work on this in my home butbI can’t spend any money at all … where do I go from here? I’ve wrapped shoe boxes in wrapping paper before as storage containers. That way I can make them look uniform without having to spend money on new containers. 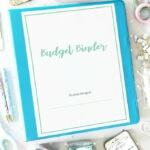 I wrote a post on getting organized without spending a lot of money here: https://justagirlandherblog.com/get-organized-without-spending-a-lot-of-money/ . Have a great day! What a perfect solution to your storage problem in that room Abby! It looks quite like it was built with the house with that crown molding. Beautiful! And as usual, inspirational! Thank you! Thanks so much, Tess! I really am lovin’ it! Hope you’re having the best week! This is beautiful, Abby! It really looks like a custom built-in piece. Awesome job! Fabulous job, Abby!! This is such eye candy! I love how you didn’t rush into finding an organizing solution. Most times my favorites are the ones I think about for a long time until I figure out just the right plan. You must be thrilled – it is so beautiful. I am definitely loving it! Thanks so much, Ginny! Hope your year is off to an awesome start! I love the organization! The entire room is stunning and functional. I, too, am inspired to tackle what my girls humorously call, “The Hoarding Room”. Wish me luck! Thanks so much, Deb! Wishing you all the best as you tackle “the hoarding room”! 🙂 Hope your year is off to a great start! This is beautiful. I love that you kept it narrow because it keeps the room looking spacious. Yes! That was definitely a priority! I am loving it! Thanks so much, Kim! Have a great weekend! 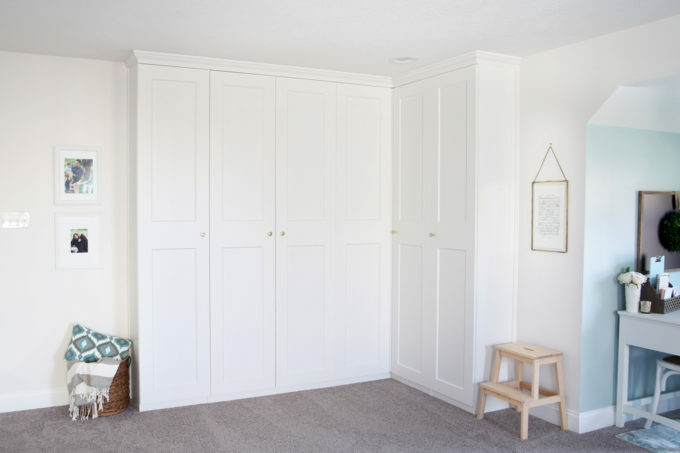 We have used the PAX system (deep cabinets) in our playroom/schoolroom for toy and craft supply storage and I love it – especially the way you can close the doors on everything! STUNNING!! How can you not be giddy when you walk into an office like that? 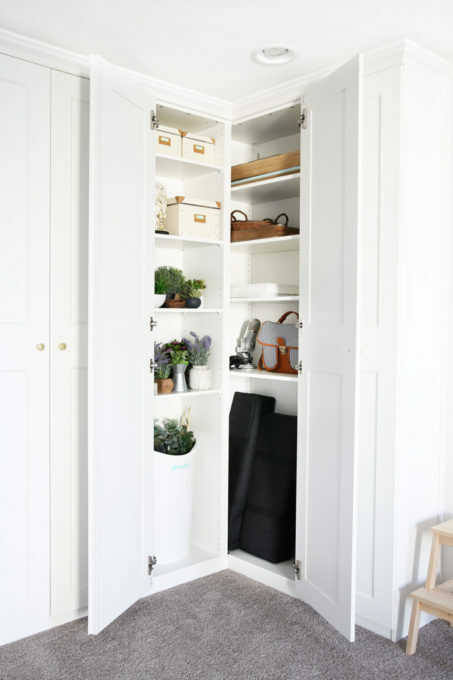 Your home is so light and airy (and organized, of course). We have the PAX system in our basement. We went with the deep cupboards to maximize storage and they work perfectly for all of our games. With 4 boys, you can never have too much storage! Isn’t it the best? We are LOVING it! Thank you, Karen! Hope you’re having a wonderful weekend! What a lovely setup! I’m jealous. My stuff is so disorganized and avalanches happen on a regular basis! I’m soglad you got your dream space. Looks fabulous Abby! I love the PAX system! 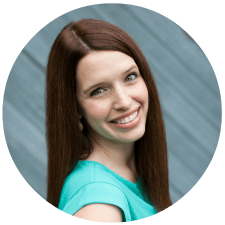 Abby I love reading your blog posts. You definitely inspire me to organize-thank you! My challenge is organizing a more traditional office/spare bedroom. I work out of our home and have a computer/printer and stacks of different types of paper as well as lots of books to find homes for. Any economical tips for making my space functional and pretty? 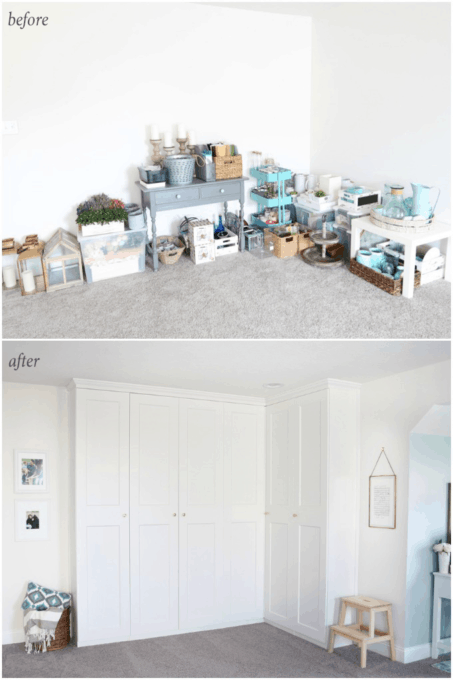 It’s hard to give advice without seeing the space, but I have repurposed items I already owned and given them a fresh look with paint before for a budget storage solution. I’ve also used wrapping paper on the back of bookshelves for a pop of color and pattern that is really inexpensive. IKEA has a bunch of inexpensive paper organization options too. I hope this helps! I love Ikea pax. When we moved into our new house we needed a wardrobe in our bedroom and I LOVE how you can just customize it to fit exactly what you need. Need a lot of hanging space? No problem. Need a lot of drawers? No problem. Only want shelves? No problem. Want glad fronts for your drawers so you can see you pretty clothes? You can get that. Love ours. It’s much smaller then our last wardrobe, but i designed it myself and it fits what we need. Love it. The only problem is that our house is only 5 min drive from IKEA so we end up going way way too often… haha. Wow, what a great look yu two achieved! It would make me happy just to walk in and seee that, too. 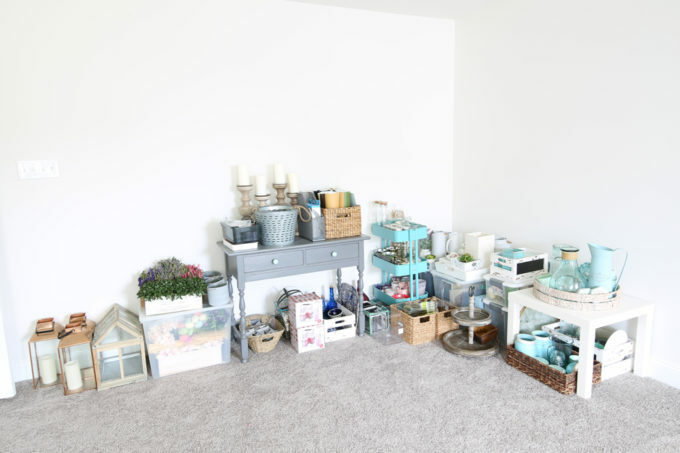 Just curious where you store the blue 3 tier shelf, and the 2 tier circlular thing along with the laterns with candles, the table and the metal bucket? You two are a great team! You are a very fortunate wife to have a husband who is talented with building things as well as computer things! Thanks so much, Rebecca! The rolling cart is being used in my boys’ playroom as an art cart currently, and many of the other items are on the other side of the room. We still have some work to do on the other half to add some more storage and decorative elements. Hope you’re having a wonderful week! I am in LOVE! I want to take over the office in my house and do the same. 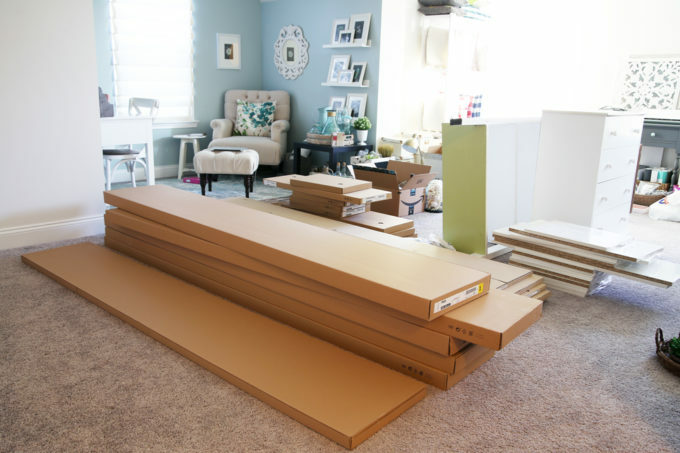 I’ve been so afraid to tackle putting together a storage system with IKEA, I had no idea they have such an amazing project planning tool!! Love!!! It looks fantastic. 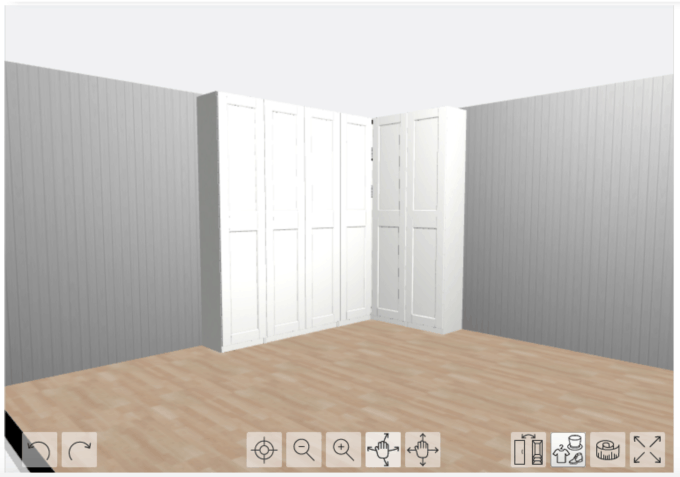 I’m looking to buy the same doors and wardrobes now that the sale is on. What color did you paint the crown molding? Just so it can match the Grimo doors. Thanks! Hi, Sotiria! We painted the trim Behr Marquee Cameo White. It is not an exact match to the GRIMO doors, but it is pretty close. Hope you’re having a great week! I was wondering if you could ever do a piece on those of us who work in an office with fitted desks, and innovative ways to keep them organised/pretty. My desk getting cluttered is a constant annoyance of mine! Thanks so much, Riva! I will probably do a desk organization post at some point! Hope you’re having a wonderful week! What a transformation!! I love that system and how neat and tidy it looks! Thanks for sharing! Absolutely lovely! 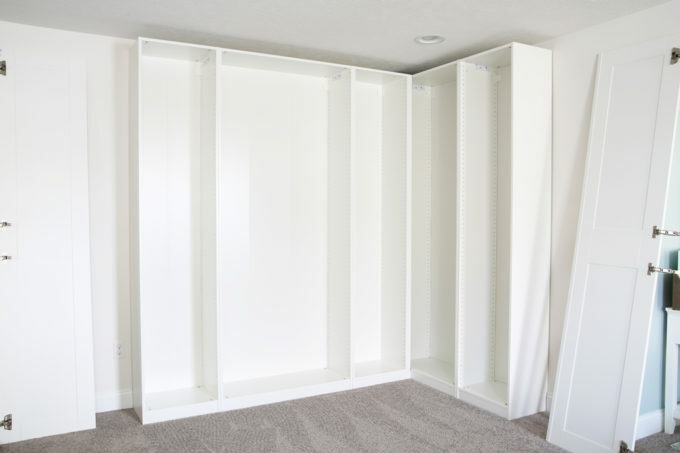 This is similar to what I want to do in our new house for our closet. I love having a place for everything. When things are nice and neat – I feel way more calm and relaxed. Yes! I am the same way. MUCH more relaxing! Hope you’re having a great day, Kimberly! The PAX system looks great – just like it belongs there. I think you were wise to stick with the narrow system instead of the deep one. 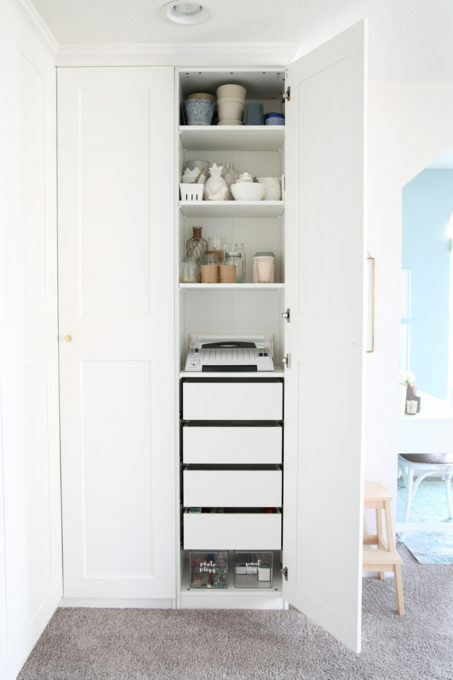 I have deep cabinets in my bathrooms and my kitchen “pantry”, and it is pretty much just a place for things to be out of sight and forgotten about. Happens to me with “extra” groceries all the time…I think I’m out of something but it’s really just gone to the black hole of the deep shelving. I love the way you’ve organized all of your stuff. Very nice space to work in each day. Thanks so much, Karen! I’m loving it! I agree… deep cabinets can make it VERY easy to lose things! I’m glad we chose the way we did. Hope you’re having a great day!